We are the premiere full service landscape drainage company in northern Il. 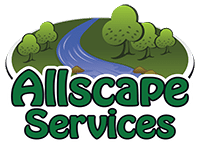 Why choose Allscape Inc. for your landscape need, because of our long company history, our strong work philosophy, and free estimates. When our drainage experts do your drainage system design and installation, your water problem will be gone. Allscape will submit plans to your city and pull any necessary permits for the job for $60.00 plus the cost of the permit fees. Even if your property has improper grading, we can design a drainage system that will solve your drainage problem..
We have customers all over the Northern Illinois locations. Not every company builds a lawnscape drainage systems the same way. There are many ways of building that can affect the quality and water flow. All our work comes with a 5 year guarantee on parts and labor. Our landscaping service comes with a 100% customer satisfaction guarantee. 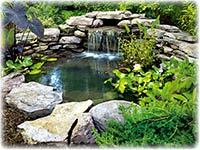 Water gardens are the greenest way to solve drainage issues. Some cities will pay you to put in a water garden. Do you have a constant wet spot in your yard? 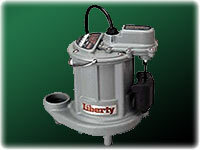 Is your sump pump constantly running? These issues are usually due to improper grading, or improper drain tile installation. Wet spots in your yard look bad, smell bad, make grass hard to cut, and attract mosquitoes. It doesn't matter if you have water collecting in a certain area of your property due to rain, or due to your sump pump. We can design a drain tile system that will solve the problem. 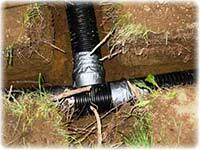 Even if your property has improper grading, we can design a drainage system that will solve your drainage problem. Why don't some cities let you tie into the storm water system? Many cities storm water systems are old and not built to handle the amount of water they deal with now and do not want to add any more. Where is the best place to move surface water to? he best places are retention ponds or water gardens because they allow the water to filter through the ground and back to the water table instead of going into the storm water system, which returns it to the rivers along with the lawn chemicals and other pollutants on your property. What kind of plants should I have in my water garden? Sporobolus, Panicum, Miscanthus, Purpurescens, Cornus, Sericea, Cornus, racemosa, Betula, Nigra, Acer, Rubrum, Acersaccharum, Aronia, Clethra, Eupatorium, Dicentra, Heliopsis, Ilex, glabralex, verticillata, Hostairisvers, IcolorNyssa, Hemerocallis, Polemonium, Quercus, Bicolordentatums, Viburnum, Prunolium. Why you shoud choose Allscape for your next landscape drainage problems. Allscape designs, installs, repairs, and maintain any thing on your property. Hi! I’m Nick Boyle. We solve lawn drainage problems. We are a full service landscape drainage company. When our drainage experts do your drainage system design, and installation your water problem will be gone. 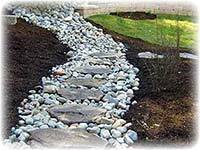 Let Allscape design your next landscape drainage project. You can count on Allscape to do a quality installation. And as always you will receive a five year warranty on parts and labor.